Definitely words to live by! Thanks John. Succinct and right-on, as usual! Great advice! Thanks for that! People that want the right fans should give content that has them written all over it without specifically having them in it. Great advice for us all to remember to keep our egos in check. Oh, come on, press releases are so exciting though! actually Olivier ... 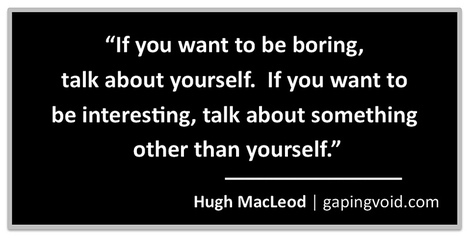 I think this advice works best for how we use Twitter ... the most interesting things I read on Twitter are not about someone talking about themselves but rather talking about something someone else is doing/has done. Definitely applicable to twitter (but everything else too). "Me, me, me" just isn't that interesting. The sooner people realize that, the sooner their see a different result (a better, stronger result). Nice post . Simple one, but nice.